Lauren Elizabeth Potter (born May 10, 1990) is an American actress. 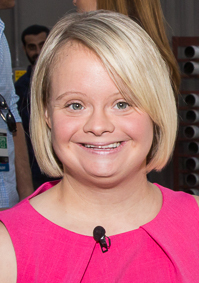 She is best known for her role as Becky Jackson on the television show Glee. She grew up in Southern California's Inland Empire. She has Down syndrome. ↑ "'Glee' star tapped to join Obama's committee". This page was last changed on 8 April 2019, at 22:05.